After months of case study and with the intimate knowledge of the situation, the Board of Directors of the Chamber of Commerce of the United States of America is forced to the conviction that if further time is lost in planning to centralize the control of the industrial energy and the material resources of the country, serious disaster is inevitable. 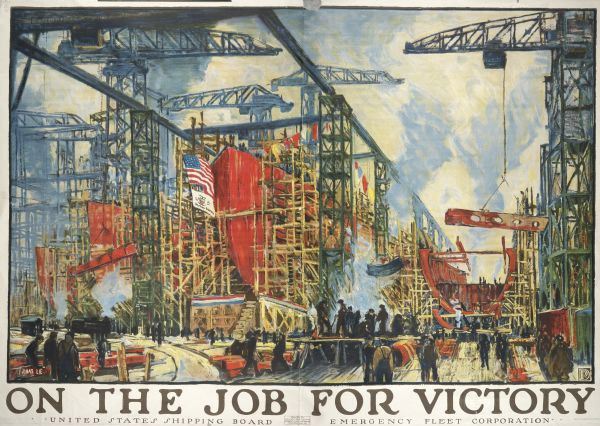 Once the U.S. entered World War I, complete homefront economic mobilization was necessary. This mobilization brought an increase in government regulation of industry. The documents in this lesson will help students understand the issues and results of a wartime economy. Wisconsin industries produced trucks, ships, artillery pieces, ammunition, uniforms, and other necessary items for the war effort. For example, the Kissel Motor Company retooled its factory to make trucks during the war after receiving a government contract. Milwaukee-based Harley Davidson sent approximately 20,000 "U.S.A." motorcycles overseas. And the Manitowoc Shipbuilding Company altered their earlier ship designs to build warships. Women, previously denied a chance to work in high-paying production jobs, made many of the products while the men were at war. Not only did factories change and convert to war production, but American farmers also instituted vast changes because of the war. American farmers had been producing food for the Allies since the war began in 1914. By the time America entered the fray, most farms had all their land under cultivation. At the urging of the federal government, Wisconsin farmers changed their crops to potatoes, beans, and wheat, which had not been grown in the state on a large scale since the mid-1800s. Potatoes and beans fed U.S. citizens, while the wheat crop and wheat products were shipped overseas for the war effort. As with factories, while men were fighting overseas, Wisconsin women and teenagers were recruited and trained to fill the need on farms. Americans contributed to the war effort not only at their work places but also in their personal lives. They replaced traditional meals based on meat and wheat with corn and potatoes, so troops would have fresh foods high in protein and carbohydrates. The Food Administration, established in June 1917 and run by Herbert Hoover, relied on Americans' patriotic spirit to save food voluntarily by wasting less, substituting various food items, and growing their own fruits and vegetables in war gardens. Wisconsin's Food Administration was the first to establish Meatless Tuesdays and Wheatless Wednesdays. Hoover was so impressed with the idea he made it a national policy in October 1917. Ads in Wisconsin papers encouraged the conservation of sugar, and local groups held canning demonstrations and published recipes with alternative ingredients. To pay for the wartime production and material costs and the costs associated with the ongoing propaganda campaign, U.S. Treasury Secretary William McAdoo encouraged all Americans to purchase government bonds promoted as Liberty Loans. Patriotic citizens who purchased the bonds could later redeem them, collecting what they paid for the bonds plus interest (3.5 percent). By April 1919 over $24 billion had been raised to cover a portion of the $30 billion the United States had spent on the war effort. The federal government set state quotas for each Liberty Loan drive on a community-by-community basis taking into consideration population, wealth, and banking resources. Wisconsin did not meet its quota during the first two bond drives. Mortified, many Wisconsinites blamed German Americans even though ethnicity was not a factor in Liberty Loan support. Heavily populated German-American parts of the state like Milwaukee, Racine, and Kenosha oversubscribed their quotas. Embarrassed by Wisconsin's poor showing, self-styled "hyperpatriots" decided to prevent these incidents from recurring. Members of the Loyalty Legion kept track of who did and did not purchase their fair share. The patriots used a variety of ways to coerce people into buying their quotas. They threatened wage earners with the loss of their jobs. Because self-employed farmers were more difficult to intimidate in this manner, the patriots often resorted to social stigmatism or physical force. Many farmers in Wisconsin found themselves visited by mobs that threatened hanging, property destruction, or tarring and feathering. Almost all victims gave in to the mob's demands whether they could afford to or not. Wisconsin met its quota in the last three drives, and in all Wisconsin residents purchased more than $300 million worth of Liberty Loans during 1917–1918. The document found in this section is a letter written by the executive secretary of the Wisconsin State Council of Defense to the Priorities Committee of the War Industries Board recommending that a priority rating be given to a Whitewater manufacturing company. It can be found in the Wisconsin Historical Society Archives. Help students understand the issues and results of a wartime economy by asking them to examine the Wisconsin State Council of Defense letter with the analysis question worksheet. Discuss responses as a class and share appropriate information from the background section above. Have students examine the role of Liberty Bond sales in the United States' wartime economy. Begin the process with the sample brochure issued by the Madison Liberty Loan Committee. Discover how World War I affected your community by encouraging students to research the output of farms or factories in your town. What changes, if any, occurred because of the war? The Wisconsin Business History website, created and updated by the University of Wisconsin–Milwaukee Urban Archives and Golda Meir Library, provides important basic information on Wisconsin companies. Cary, Lorin Lee. "The Wisconsin Loyalty Legion, 1917-1918," Wisconsin Magazine of History, Autumn (1969): 33-50. Cornebise, Alfred E. War as Advertised: The Four Minute Men and America's Crusade, 1917-1918. Philadelphia: The American Philosophical Society, 1984. Creel, George. How We Advertised America. New York: Arno Press, 1972. Crowell, Benedict. The Giant Hand: Our Mobilization and Control of Industry and Natural Resources, 1917-1918. New Haven: Yale University Press, 1921. Cuff, Robert D. The War Industries Board. Baltimore: The John Hopkins University Press, 1973. Darracott, Joseph, and Belinda Loftus. First World War Posters. London: Imperial War Museum, 1972. Falk, Karen. "Public Opinion in Wisconsin During World War I," Wisconsin Magazine of History, June (1942): 389-407. German-Americans. Produced by Jerry Baber. 30 min. Schlessinger Video Productions, c. 1993. Videocassette. Glad, Paul. The History of Wisconsin, Volume V, War, a New Era, and Depression, 1914-1940. Madison: The State Historical Society of Wisconsin, 1990. History Committee of the Four Minute Men of Chicago. The Four Minute Men of Chicago. Chicago: 1919. Krog, Carl E. "The Battle Against the Kaiser: Social and Cultural Conflict in Marinette, Wisconsin During the World War I Era," The Yearbook of German-American Studies, 26 (1991): 231-247. Lorence, James J. Enduring Voices: Document Sets to Accompany The Enduring Vision. Lexington: D.C. Heath and Company, 1993. Lorence, James J. The Enduring Vision: A History of the American People. Lexington: D.C. Heath and Company, 1993. Mock, James R. and Cedric Larson. Words That Won the War. Princeton: Princeton University Press, 1939. The Moving Picture Boys in the Great War: Hollywood Goes to War with Cameras Blazing. Produced by David Shepard. 52 min. Republic Pictures Home Video, 1986. Videocassette. The Papers of Woodrow Wilson-November 11, 1917- January 15, 1918, Volume 45. Princeton: Prince ton University Press, 1984. Paris, Michael. The First World War and Popular Cinema. Edinburgh: Edinburgh University Press, 1999. Stevens, John Dean. "Suppression of Expression in World War I." Ph.D. diss., University of Wisconsin-Madison, 1967. Tindall, George Brown. America: A Narrative History, Volume II. New York: W.W. Norton & Company, 1988. Tolzmann, Don Heinrich. The German-American Experience. Amherst: Humanity Books, 2000. Tolzmann, Don Heinrich. The German-American Soldier in the Wars of the U.S. Bowie: Heritage Books, Inc., 1996. Trask, David. World War I at Home. New York: Wiley, 1969. Trattner, Walter J. "Julia Grace Wales and the Wisconsin Plan for Peace," Wisconsin Magazine of History, Spring (1961): 203-213. Vogt, George. "When Posters Went to War," Wisconsin Magazine of History, Winter (2001), 38 -47. Zeitlin, Richard H. Germans in Wisconsin. Madison: Wisconsin Historical Society, 2000. B.12.1 Explain different points of view on the same historical event, using data gathered from various sources. B.12.2 Analyze primary and secondary sources related to a historical question to evaluate their relevance, make comparisons, integrate new information with prior knowledge, and come to a reasoned conclusion. B.12.4 Gather various types of historical evidence, including visual and quantitative data, to analyze issues of freedom and equality, liberty and order . . . and form a reasoned conclusion in the light of other possible conclusions. This lesson was developed by the Office of School Services for the secondary-level classroom. Please adapt to fit your students' needs.